I learned a great deal about firefighting and the fire service from my father, who joined the fire department in 1938 and retired as fire chief in 1975, the year after I started as a career firefighter. However, one of the most relevant lessons for firefighting in the modern built environment I learned from my mother. During the fall and winter months in New England, she would frequently tell me, “Close the door! Were you born in a barn?” She didn’t know it at the time, but this would be useful advice for today’s firefighters. While true in the 1970s, this holds true today. Firefighters must understand the modern fire environment and the effect of firefighting tactics on fire dynamics. In today’s fire environment, we must limit the oxygen provided to the fire. The increased use of synthetic materials, which often have a greater heat of combustion (energy released per kilogram of fuel). Increased quantity of fuel (mass) and potential energy of the fuel. Increased emphasis on energy efficiency, which results in a higher level of insulation and limited air exchange between building interiors and the exterior. Although we sensed that the environment was changing, we clung to the fire development model of four distinct stages: incipient, growth, fully developed and decay. Flashover defined the rapid transition from the growth to fully developed stage, with full surface involvement of the fuel in a compartment. Generally the relationship between fire development and atmospheric oxygen was not addressed, with the exception of backdraft conditions, which were defined as having high temperature and oxygen deficiency. Heat of combustion: Total thermal energy released by combustion of unit mass of a given substance, without regard to time. Heat of combustion is typically measured in Joules, but many firefighters in the United States are more familiar with the term British thermal unit (Btu). Heat release rate (HRR): Rate of thermal energy production generated by combustion. HRR is the fire’s power (energy released per unit of time). Heat release rate is typically measured in watts, kilowatts or megawatts. There is no standard unit of measure for heat release rate, but it can be expressed in terms of Btu/second or in the equivalent mechanical term horsepower: HRR is the power developed by combustion. While the relationship between oxygen and energy release was known to a fire officer 148 years ago and quantified by a scientist 97 years ago, somewhere along the line, the fire service lost this important concept as it applies in a structural firefighting context. In the 1970s, scientists at the National Bureau of Standards rediscovered the relationship between oxygen consumption and energy release during combustion and developed a method to reliably measure heat release rate. However, it was several decades before the concept of HRR began to slowly make its way into the fire service. A fuel package is a specific amount and configuration of fuel. For example, an upholstered reclining chair would be a common fuel package found in a residential occupancy (or a fire station). Ignited in an open, unconfined area, combustion of a fuel package and fire development is dependent on the characteristics and geometry of the fuel. For example, ignition of the seat cushion on the recliner would result in a fire that would quickly grow, with HRR increasing as more of the fuel became involved. Once the chair became fully involved, the HRR would diminish and the fire would decay as the fuel was consumed. This fire behavior reflects the traditional fire development curve, with incipient, growth, fully developed, and decay stages of development. When fire development is controlled by the characteristics and geometry of the fuel, it is described as a fuel-controlled or fuel-limited fire. Fire development changes significantly when the same fuel package is placed in an enclosure. One difference is that the compartment linings absorb thermal energy and radiate that energy back into the compartment. Even more important is that compartmentation limits the amount of atmospheric oxygen that is available to support combustion. Release of thermal energy during combustion is directly proportional to the amount of oxygen used in this chemical reaction. In a compartment that is completely closed, there is a finite amount of oxygen available. For example, when a burning candle is covered with a glass, HRR is reduced, the flame dims and is eventually extinguished as the oxygen in the glass is consumed. As HRR increases, the rate at which the oxygen is consumed increases proportionally. Given substantial heat of combustion and high HRR from many synthetic fuel packages (think furniture, carpet and other building contents), the oxygen available in a single room or even multiple rooms can be quickly used up. As the oxygen concentration decreases, the HRR decreases as well and the fire will begin to decay. Note: Although the temperature will decrease as the fire decays due to lack of oxygen, the temperature will remain high for some time, continuing pyrolysis of fuel packages within the compartment and adding gas-phase fuel to the hot upper layer—creating a dangerous situation for firefighters entering the room. It’s important to recognize the difference between fires that are fuel-controlled/limited and those that are ventilation-controlled/limited. It’s important to note that even when exiting occupants leave a door or window open, or a window fails due to flame impingement, modern fuels have sufficient HRR to quickly develop ventilation-controlled/limited conditions. The fully developed stage of fire development in an intact (or relatively intact) compartment will always be ventilation-controlled/limited. Increasing ventilation to a ventilation-controlled fire will rapidly increase HRR. If the fire has some ventilation due to an existing opening or has self-vented, this increase will be even more rapid! Legacy fuels comprised of wood and natural fiber materials have a lower heat of combustion and a lower peak HRR; as a result, fires involving these materials develop much more slowly, remaining fuel-controlled for a considerable period of time. In comparison, modern fuels composed of synthetic materials often have a high heat of combustion and high peak HRR; fires involving these materials develop quickly, rapidly reducing the oxygen concentration in the involved and adjacent compartments. Many of the tactics used by today’s firefighters were developed in between the 1940s and 1960s. Those firefighters often encountered growth stage fires in a fuel-controlled/limited burning regime. Under these conditions, rapid ventilation performed ahead of fire attack slowed the progression to flashover and improved conditions for interior crews. Today’s firefighters face considerably different conditions. Fires that have progressed beyond the incipient stage are frequently ventilation-controlled/limited when the first companies arrive. The time between an increase in ventilation and rapidly worsening fire conditions is much shorter than it has been in the past. Having lines in position as Fried and others suggested in the 1970s  remains good advice, but we need to rethink what in position actually means, and may want to more closely couple ventilation and fire attack. Most firefighters have learned that “ventilation is the planned and systematic removal of heat, smoke and fire gases, and their replacement with fresh air.” Not a bad definition, but there are a few problems. The first is that ventilation is occurring in buildings all the time, even when they are not on fire. Ventilation is simply exchange of the atmosphere inside the building with that on the outside. In a firefighting context, tactical ventilation is the planned, systematic and coordinated removal of heat, smoke and fire gases, and their replacement with fresh air. A critical and often overlooked component of the definition of tactical ventilation is that it not only involves removal of smoke, but also involves introduction of fresh air. The mass of hot smoke and fire gases exiting the building must be matched by an equivalent mass of fresh air entering the building. Going back to the description of fuel- and ventilation-controlled/limited burning regimes, tactical ventilation has a limited effect under fuel-controlled/limited conditions, but a major impact on HRR and fire development when conditions are ventilation-controlled/limited. The other side of the coin can be described as tactical anti-ventilation. This is not a philosophy that ventilation is bad or a stance against tactical ventilation. Tactical anti-ventilation is simply the planned, systematic and coordinated confinement of heat, smoke and fire gases, and the exclusion of fresh air. Tactical anti-ventilation limits HRR and fire growth by limiting the atmospheric oxygen provided to the fire. In addition, it is used to confine smoke to areas that are currently smoke logged, and keep smoke from uncontaminated areas. Closing an open door to limit introduction of air or to confine smoke. Controlling the door in a closed position after entry to limit inflow of air. Delaying tactical ventilation until a hoseline has water on the fire. Pressurizing uninvolved spaces (e.g., an attached exposure) to prevent smoke infiltration. Research conducted by UL has identified a number of tactical implications related to horizontal and vertical ventilation. The challenge facing firefighters and fire officers is how to translate the tactical considerations into practical tactics on the fireground. The following doctrine is posed in the context of a residential occupancy (one- or two-family home, garden apartment unit, townhouse, etc.). Note: It’s important to recognize that these statements are provided as guidance to thinking individuals and not as absolutely inviolable concrete rules. Critical elements of context in fireground operations include company staffing and total staffing available on the fireground. In an urban environment where multiple companies will arrive quickly, coordination is essential for concurrent tactical operations. In a rural environment where staffing is limited, it may only be possible to perform one tactical operation at a time. In this situation, there is much less of a coordination challenge, but proper sequencing of tactical operations is essential. That said, the following approaches to implementing anti-ventilation on the fireground can be useful in both of these contexts. If the door or doors are open, they should be closed as soon as possible. In the modern fire environment, most fires beyond the incipient stage will be ventilation-controlled when the first company arrives. 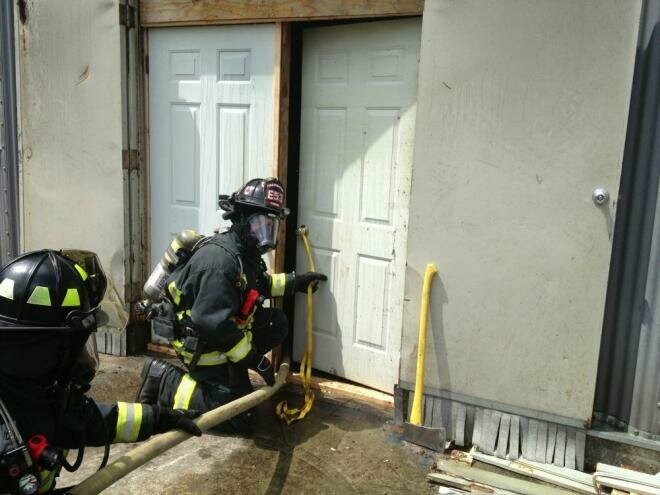 Closing the door until the first line is ready to enter will limit air flow to the fire and reduce heat release rate. If the fire is not ventilation-controlled, closing the door will not have a positive impact. However, it is unlikely to have a negative effect as well. If occupants remain inside (or have gone back in through the open door in an effort to rescue others), an argument could be made that closing the door might make it more difficult for them to find the exit. However, under ventilation-controlled conditions, the increased air supply will quickly make conditions untenable and the flow path between the open door and the fire will result in fire spread along this path, further reducing tenability and potential for safe occupant egress. The short answer is, if the door is open, close it. When the door is opened, the clock is ticking on increased HRR. The door should remain closed until a charged hoseline is in place and the crew on the hoseline is ready to make entry for fire attack. Door entry procedure should include assessment of B-SAHF (building, smoke, air track, heat, and flame) indicators and forcible entry requirements (if the door is closed and locked). If forcible entry is required, it may be forced before the crew is ready to enter, but should be controlled in a closed position after it is forced. The door may be opened briefly and partially to assess conditions and if necessary to cool the hot upper layer prior to entry, but should generally remain closed until the crew on the hoseline enters the building. If the fire is shielded from immediate direct attack from the door, it should be closed after entry to limit air flow to the fire and reduce the flow path between the entry point and the fire. Limiting air flow will slow the increase in HRR. Limiting the flow path (it cannot be eliminated by closing the door completely due to the space required to pass the hoseline) will reduce the risk of fire spread towards the entry point. The question of who will maintain door control and aid in advancement of the line and how might this be accomplished with limited staffing is a significant question. As always, it depends. If a crew of three is on the line, one member may control the door with a two-person team working inside. With smaller crew sizes, the standby team (two-out) may be able to control the door. If operating with limited staffing (three) in rescue mode, the apparatus operator may need to add door control to their rather substantial list of critical tasks after charging the attack and standby lines. When performing vent, enter, isolate and search (VEIS) operations, closing the door to the room being searched is a critical task to prevent members from being in the flow path. When searching from the interior, the same action can be equally important. Closing the door to the room being searched allows the searcher to tactically ventilate the room if necessary while preventing a flow path between the fire and the room being searched. In the past, firefighters may have been trained to “vent as you go” when searching. The concept was that venting the rooms being searched would improve tenability and increase visibility. However, horizontal ventilation also creates a flow path between the fire and the ventilation opening. If the opening serves as an inlet (due to vertical position in relation to the fire or wind effects), it may improve conditions in the room, but has the potential to worsen fire conditions due to increased HRR. If the opening serves as an outlet, a flow path for fire spread is created, which will potentially worsen conditions in the room being searched. Once the room has been searched, the decision to keep the door closed or to open it will depend on the ventilation plan. The characteristics of the fire environment have changed, and our tactics must change to meet them. Today, we should no longer refer to simply horizontal and vertical ventilation. Rather, we must think about the effect ventilation has on today’s fires, and employ the concepts of tactical ventilation and tactical anti-ventilation as appropriate. International Fire Service Training Association (IFSTA). (1970) Fire ventilation practices (5th ed.). Stillwater, OK: Fire Protection Publications. Braidwood J. Fire Prevention & Fire Extinction. Bell & Daldy: London, 1866. Fried E. Fireground tactics. H. Marvin Ginn: Chicago, 1972.